‘An Introduction to Social Media for Scientists‘. I have wanted to mention this article published in PLOS Biology ever since it came out in April 2013, but somehow never got around to it. But as I reread it earlier this week, I was reminded how this article must be mentioned on a blog like mine. An Introduction to Social Media for Scientists is written by Holly M. Bik and Miriam C. Goldstein from University of California Davis and University of California San Diego and is an excellent place to start for researchers considering trying out social media or for enthusiasts of social media for science communication who are in search of good arguments they can use to persuade others of why they must set up a Twitter account, start blogging or establish some other form of online presence. How online interactions have the potential to enhance ‘‘broader impacts’’ by improving communication between scientists and the general public. They go on to address different kinds of social media and how they can be used, and provide advice to new users on how to get started. A useful (and fun) feature of the article is a flowchart that can help newcomers find out which media might be most relevant for them to try out and solution to common online communication fears. Throughout the article the authors mention the stigma which is often attached to online activities. They acknowledge how many researchers are skeptical towards the media and regards it as a waste of time and a distraction from true scientific work. In a response to this the authors have set out to address some of the many misconceptions and misinterpretations of what social media can contribute with. And in my opinion it works. One could argue that they don’t spend much energy on the risks or disadvantages of social media for science communication (of which there are of course several), but they are plenty to be found elsewhere. “Social media and internet-based resources are increasingly ubiquitous. Thus, there is a pressing need for scientific institutions to offer formalized training opportunities for graduate students and tenured faculty alike to learn how to effectively use this new technology”. Internships, coincidences, childbearing and passion for communicating seems to be key themes in making a career in science communication in Germany. At least those are some of the conclusions I made when attending Science Communication Career Day at Heidelberg University last week. The Career Day was all in all a good experience. Logistically well organised and with an interesting bunch of speakers. There was even ‘fancy new media’ involved. A hashtag (#scicomcareerday) had been assigned and it was enthusiastically noted when 20 tweets had been reached and later on 50 tweets! Being beginners in using this it worked remarkably well. The day was organised with a first session focused on Press and Corporate Communication. The presenters were in general at the level of Head of Communication etc. They all came from a scientific background (predominately in biology and with a ph.d.) but had moved into communication. 5 of 6 speakers were women, and in presenting their road from science to communication they all mentioned “and then I had children…” as one of the reasons for leaving their academic field and getting into science communication, which granted more flexibility. Although many did say that they found communicating to be fun and through internships had found a passion for exactly communicating, I was surprised to find that none of the speakers of the session seemed to have a passion for their scientific area, and that it wasn’t a desire to communicate their knowledge which was of interest to them. My impression was, putting it a bit roughly, that their science background had basically just proved to be an advantage in getting jobs in communication… Perhaps one of the reason I got this impression was that the presenters where at Head of Communication level, and thus had gone on to much more than science communication and also (or primarily) worked crisis communication, corporate communication etc. The second session made up for the tendency of working with communication in general and not specifically science communication. Especially inspiring were three communication officers from EMBL (European Molecular Biology Laboratory) who with enthusiasm talked about the joy of communicating science. Again, it was clear that internships seems to be the thing in Germany if you want to get into science communication. When asked by the participants (who were primarily ph.d. students at University of Heidelberg) if they should go for getting an internship or take an extra degree in communication or journalism the response was either that it didn’t matter or that they should definitely go for the internships! Not being so well acquainted with how things work in Germany, to me it seemed at bit surprising that this was their main recommendation. I guess however it could be translated into: get practical experience! and that internships is one way of getting this. All in all, it was a good day and it was fun to get into some German Science Communication. The round table lunch idea, where you could have lunch with a speaker was a good idea and worked okay. Being a career day the objective was of course to inspire to and show how you can also take your science career into a communication direction. This meant that at least the round table I participated in became very focused on the internship discussion and concrete questions about how these internships work. In asking around for science communication networks in Germany it was my impression that there is not formal network and few of the presenters had knowledge about formal science communication training programmes at university (see below), but were much more practice based. As in many other places the science communication community seemed much more to be a personal network thing. 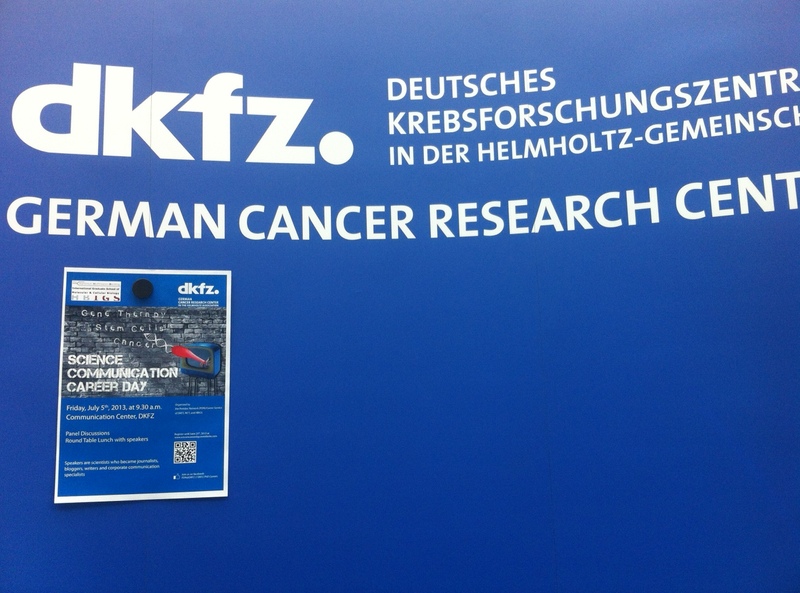 Many of the presenters had either worked or done internships with DKFZ (German Cancer Research Center), who was also one of the main organisers of the day, and knew each other from there.